A hat-trick from Nottingham Forest striker Britt Assombalonga condemned Fulham to their sixth league defeat of the season to increase the pressure on manager Felix Magath. Assombalonga, 21, scored twice, the second from the penalty spot, before Ross McCormack pulled a goal back. Hugo Rodallega equalised and McCormack struck again to put Fulham 3-2 up. But Michail Antonio, Assombalonga and Jamie Paterson all scored to move Forest back to the top of the table. The result leaves Fulham bottom of the league and already four points from safety. Since taking charge in February, Magath has overseen just four wins, one of those coming this season in the Capital One Cup against Brentford. He was the third manager at Craven Cottage last season following the dismissals of Martin Jol and Rene Meulensteen but was unable to prevent their relegation from the Premier League. Following Saturday's 3-0 defeat at Reading, supporters were calling for the manager to be sacked and he did not help matters when he admitted he could not explain their poor start to the Championship season. Forest, on the other hand, have enjoyed an excellent start to the season with five wins and two draws, helped largely by Assombalonga, who joined in August for a club-record fee of around £5.5m. He took his tally for the season to eight goals in nine games as he completed only his second senior hat-trick. His first came as he headed home a cross from Henri Lansbury and he then converted a spot-kick after Antonio was tripped by Shaun Hutchinson. McCormack, who cost Fulham £11m, scored his first league goals for the club either side of Rodallego's strike to mark an unlikely turnaround. But despite having six defenders in their starting XI, the visitors crumbled. Antonio rattled in from the edge of the box before Assombalonga netted his third from close range. Paterson completed the scoring when he ran through on goal to calmly send the ball past Gabor Kiraly from 15 yards. The Cottagers are now without a win since they beat Norwich 1-0 on 12 April. Nottingham Forest coach Steve Wigley said: "I think we were fortunate. We started well and when we went 2-0 up you would expect us to control the game, but they scored a great free-kick and I thought they played very well up to about 65-70 minutes. "But once it became a shoot-out we knew we had players who could score a goal and we went for it, and showed tremendous character." Fulham boss Felix Magath added: "They played very well and scored three times. We were very unlucky. "I understand the fans' frustrations. I'm very sad we are bottom with one point. It is terrible for the players, myself and the supporters." Match ends, Nottingham Forest 5, Fulham 3. Second Half ends, Nottingham Forest 5, Fulham 3. Jamaal Lascelles (Nottingham Forest) is shown the yellow card for a bad foul. Foul by Jamaal Lascelles (Nottingham Forest). Attempt missed. Ross McCormack (Fulham) right footed shot from outside the box is high and wide to the left. Assisted by Fernando Amorebieta. Jamie Paterson (Nottingham Forest) is shown the yellow card for excessive celebration. Goal! Nottingham Forest 5, Fulham 3. Jamie Paterson (Nottingham Forest) left footed shot from the centre of the box to the bottom right corner. Assisted by Michail Antonio. Attempt missed. Patrick Roberts (Fulham) left footed shot from the centre of the box is high and wide to the left. Assisted by Nikolay Bodurov. Corner, Fulham. Conceded by Chris Burke. Jack Hunt (Nottingham Forest) wins a free kick on the right wing. Substitution, Fulham. Patrick Roberts replaces Mark Fotheringham. Goal! Nottingham Forest 4, Fulham 3. Britt Assombalonga (Nottingham Forest) right footed shot from very close range to the bottom right corner. 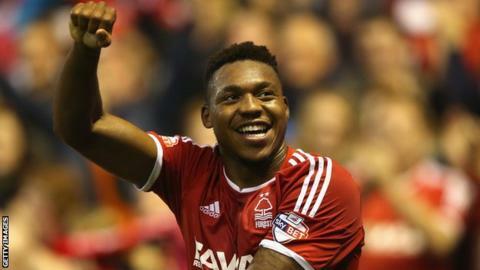 Britt Assombalonga (Nottingham Forest) hits the left post with a header from the centre of the box. Assisted by Chris Burke with a cross. Offside, Fulham. Chris David tries a through ball, but Ross McCormack is caught offside. Goal! Nottingham Forest 3, Fulham 3. Michail Antonio (Nottingham Forest) right footed shot from the centre of the box to the bottom right corner. Assisted by Michael Mancienne. Corner, Nottingham Forest. Conceded by Dan Burn. Attempt missed. Ross McCormack (Fulham) right footed shot from outside the box is close, but misses the top right corner. Assisted by Hugo Rodallega. Corner, Fulham. Conceded by Michail Antonio. Scott Parker (Fulham) is shown the yellow card. Corner, Fulham. Conceded by Jack Hunt. Corner, Fulham. Conceded by Karl Darlow. Attempt saved. Ross McCormack (Fulham) right footed shot from long range on the left is saved in the bottom left corner. Assisted by Mark Fotheringham. Attempt missed. Britt Assombalonga (Nottingham Forest) header from the centre of the box is too high. Assisted by Daniel Fox with a cross following a set piece situation. Substitution, Nottingham Forest. Jamie Paterson replaces Ben Osborn. Attempt missed. Chris Burke (Nottingham Forest) header from a difficult angle on the right is close, but misses to the right. Assisted by Daniel Fox with a cross. Goal! Nottingham Forest 2, Fulham 3. Ross McCormack (Fulham) right footed shot from the centre of the box to the bottom left corner. Assisted by Hugo Rodallega. Foul by Chris David (Fulham).